BUD is endearing from the second you hit the start button. The world of Grow Home is a strange but beautiful combination nature and technology. I got lost for a minute just looking around to try to figure out how everything went together. The moment I started climbing up the bean stalk though, all of my focus shifted to not falling. Climbing feels great and has just the right balance of awkwardness and control to keep you aware of the game’s difficulty without it feeling overbearing. 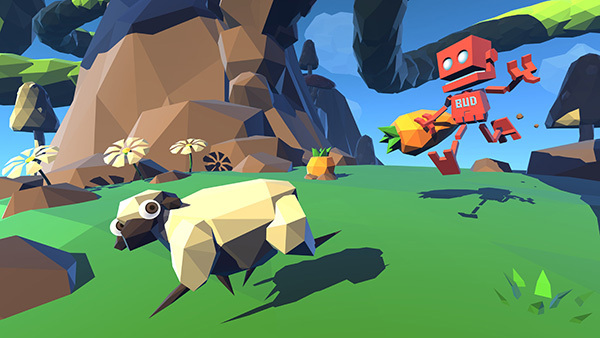 When BUD gets moving, Grow Home is a wonderful experience. When BUD falls, you feel terrible and want to immediately get back on the beanstalk. It’s a truly unique game and I kind of wish I could bring BUD with me to explore other games. Thanks for getting back up, Grow Home. Game Curious Grow Home – Wanna Get High, BUD?